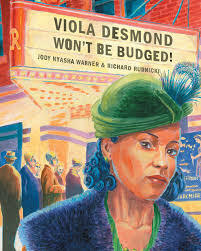 Viola Desmond was one brave woman! Now come on here, listen in close and I’ll tell you why. These are the opening lines of this Canadian history lesson in picture book format. It tells the story of a woman who lived in Nova Scotia and who stood up for her rights and against racial discrimination in 1946. Asked to move to the balcony of a movie theatre, where all the other black people were sitting, she refused to budge and was arrested and fined for not paying the proper ticket price. She appealed the decision, but the court, not willing to tackle the issue of racism, cancelled the appeal. Although Viola Desmond’s particular case against discrimination was not successful, she inspired many others to take up the fight, and eventually (in the 1950s) segregation was outlawed. The story is told in language reminiscent of the African oral tradition, and vibrant illustrations that fill each two-page spread do much to bring the social context of 1940s Nova Scotia alive. An author’s note entitled A Glimpse of African Canadian History is included on the last page.